Nikon is one of the biggest players in the Digital Image Industry focusing mainly in production of point&shoot cameras, compact system cameras, DSLR cameras and camera lens accounting with a worldwide market share of about 12.6 % (according to IDC Japan) and having as its major rivals both Canon and Sony. Due to the overall declining sales of point&shoot cameras cross market and increased popularity of Compact System Cameras mainly the Micro Four Thirds System (from Olympus and Panasonic), Sony NEX and Samsung NX that have started to predate sales in both the point&shoot market and DSLR Nikon decided to come out with a short term solution releasing the Nikon 1 system. By doing so Nikon was quite thoughtful producing a new compact system camera system that would be able to do two things: get photographers that would normally purchase a point&shoot camera and at same time not predating sales on their cash cow DSLR lineup. To come up with this strategy Nikon studied well the existing sensor sizes having the 35mm full frame as a reference. 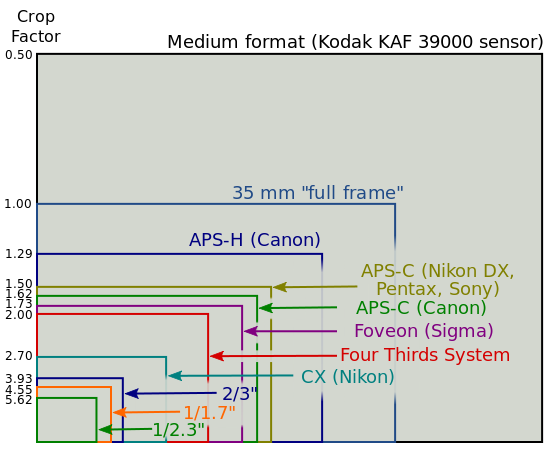 Taking into account that Nikon, Sony and Canon flagship DSLR cameras use a full frame sensor size (35mm) and their pro-summer DSLR line-up uses an APS-C sensor size Nikon had to produce something smaller in order to prevent cannibalization of their cash cow DSLR segment. By looking at options they could come out with a Four Thirds sensor size that according to Olympus is the ideal size for digital cameras. 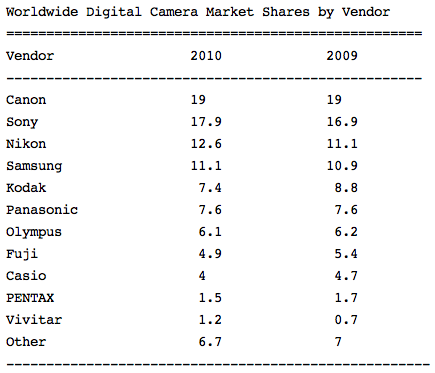 However if going that route Nikon could actually still be predating sales of their DSLR line-up. Their main focus was at the time to come out with a new system that would bring potential point&shoot customers to a new system with higher sales margins. As a result Nikon decided instead to come out with a second best and developed the CX sensor size which was small enough in order not to predate sales from their DSLR lineup (full-frame and APSC) and at same time able to bring out something innovative and new that could attract new customers. The Nikon 1 CX system is a compact system camera that presents a good alternative to point&shoot cameras providing a much higher dynamic range, noise reduction capabilities, low light photography and an interchangeable lens system. Besides having their own dedicated lens to the Nikon 1 CX format Nikon also allows compatibility with NIKKOR F mount lens allowing as well Nikon DSLR photographers to use the Nikon 1 series as a lightweight travel alternative. To achieve compatibility between both systems (lens on the Nikon 1 CX work with CDAF (contrast detect auto focus) whilst the NIKKOR F lens work with PDAF (phase detection auto focus)) Nikon developed an hybrid auto focus system that works with both methods. This enabled Nikon to use the Nikon 1 CX compact system camera as a laboratory for development of a future compact system oriented to professional photographers. With the development of the Nikon 1 CX compact system camera Nikon managed to keep a stronghold on their current DSLR lineup Nikon, test new technologies that allow future compatibility of their NIKKOR F lens system and at same time play the one step backwards two steps forward strategy deceiving Canon with the Nikon 1 CX system as a Trojan Horse. Nikon as well as all other camera manufacturers are very well aware the future of professional digital cameras will be in terms of a compact system without a mirror. However it decided to release a system that will not be a substitute of its DSLR lineup as that would predate its cash cow DSLR line up. By introducing the Nikon 1 CX system it managed to get a foothold and experience in latest sensor and auto focus technologies enabling it to be better prepare for the game ahead once Canon introduces its first compact system camera. By waiting for Canon to come out with its compact system camera that will rival their DSLR market Nikon is able to master hybrid focus technologies as well as new sensor technologies. If we analyze the options of either an APSC or Full Frame sized sensor both have their pros and cons. The bigger the sensor the higher the dynamic range and better low light noise performance. However that comes out with a caveat – bigger lens and bigger camera bodies as can be seen in the NEX or NX systems that have lens that seem unbalanced when compared to body size. Canon as a leader is playing the waiting game and seeing what consumers are looking at and will demand in a compact system camera which has to be something DSLR systems are not able to which is a more portable size and smaller lens. Actually the release of the Canon G1X may have had played a role here where Canon seems to be signaling market it will go for a Four Thirds size sensor that will be compatible with all its EOS EF and EFS lens using a similar route as Nikon did with their hybrid auto focus technology. By playing this game with Canon, Nikon may well prove to be the long run winner as it comes with a higher experience in field of compact system cameras, small sensor technologies and smaller bodies ergonomics. Soon we will know Canon’s answer to existing compact system cameras that will likely shatter market and Nikon’s answer with a compact system camera mount that will match/surpass Canon’s one and replace its current DSLR line up while keeping full compatibility with NIKKOR F mount lens.